In line with fostering regional partnerships with evaluation associations to pursue common goals through mutual collaboration and reciprocal support, IDEAS and the Asia and Pacific Evaluation Association (APEA) officially signed a Memorandum of Understanding on April 27, 2017 in Bishkek, Kyrgyzstan, during the Third Global Assembly of Eval-Partners. Some common goals shared by IDEAS and APEA include the development and enhancement of members’ capacity to conduct high quality evaluations, promotion of good governance, use of evidence, and accountability for development. IDEAS is discussing similar agreements with Caribbean Evaluation Association and AfREA and welcomes the same with other regional evaluation associations. 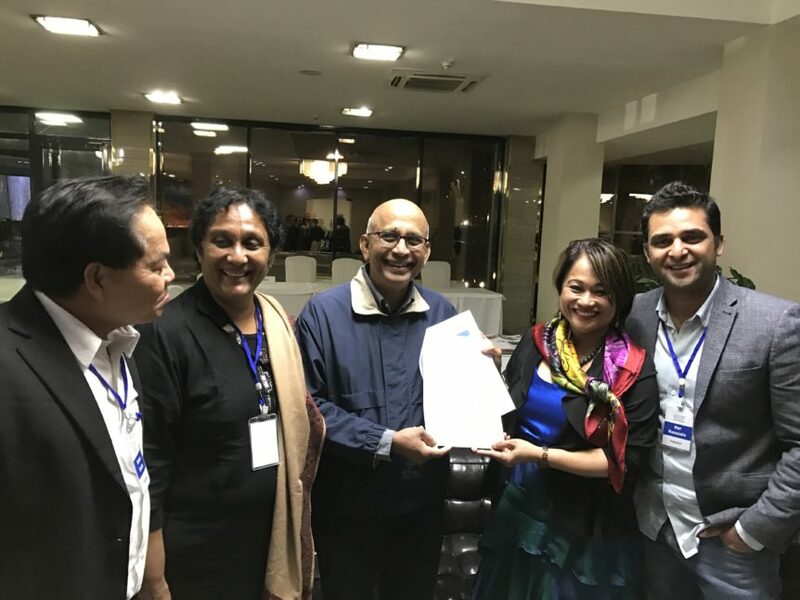 In the Picture – Present from the left are Romeo Santos, Isha Miranda and Arunaselam from APEA and Susan D. Tamondong and Hur Hassnain from IDEAS.